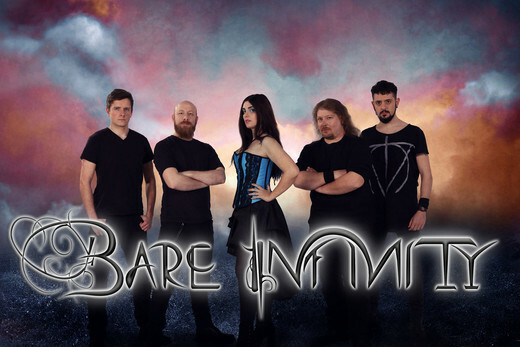 Bare Infinity were formed in 2003 by Tomas and Christiana. The band first started out as a project however due to the bands demo success, the need for a steady lineup was created. Later on in 2004 the band entered a recording studio to begin the recordings of their first album comprising of songs written by Tomas. However due to a number of unfortunate events and Alex's decision to leave the band , Bare Infinity halted the recordings of the album. Alex's place was filled by Sverd and the band then began touring Greece appearing at numerous Festivals such as the Main stage of the Metal Healing Fest , Opening for Epica in Athens and soon after requested to represent Greece at the International Gothic convention in Italy Bologna (DarkFest 3) supporting Katatonia. Throughout this period Bare Infinity received numerous press critic and was featured in many magazines and online zines, many of them hailing Bare Infinity as by far Greeces' most promising metal act with female vocals. In 2008 the band began recording their album again at the Fragile Studios (Vaggelis Yalamas – Fragile Vastness) in Athens. However due to problems ,the band had no other choice than to part ways with Christiana. Later on in the year after a few months of auditioning the Band chose and welcomed Angel as the bands new front woman . With Angel, the band entered the Artemis Studios (Mark Adrian) in Athens and finished the recordings of the long awaited and highly anticipated album "Always Forever".